WWL is excited to be presenting our 3rd group showcase ‘Touch’ at the beautiful Livingstone Studio in Hampstead. Livingstone studio is a long-established textile design studio, with an adjoining gallery, situated in a converted early 18th century coach house in the heart of historic Hampstead Village. The gallery is well known for exhibiting textiles and ceramics selected from around the world by Inge Cordsen. WWL is pleased to invite and show work from a womenswear designer, Tomoko Yamanaka who is based in the Livingstone Studio. Have you ever wanted to touch something in a gallery or a museum but then you saw a sign saying do not touch? Or felt frustrated when things are locked inside display cases so that you cannot touch. Remember when we could all touch the Rosetta Stone in the British Museum? It was much more fun, wasn’t it? As we know touching is just as important as seeing when appreciating objects, so we would like to encourage the guests to touch, feel and enjoy our crafts at this exhibition. Mica has re-worked some of her favourite herringbone scarves in wool and cashmere exploring in new colours. Kaori has added an extra touch to her regular plates with hand painted criss cross patterns and is showing the range of tableware made in her distinctive hand formed designs with matt and smooth glazes. 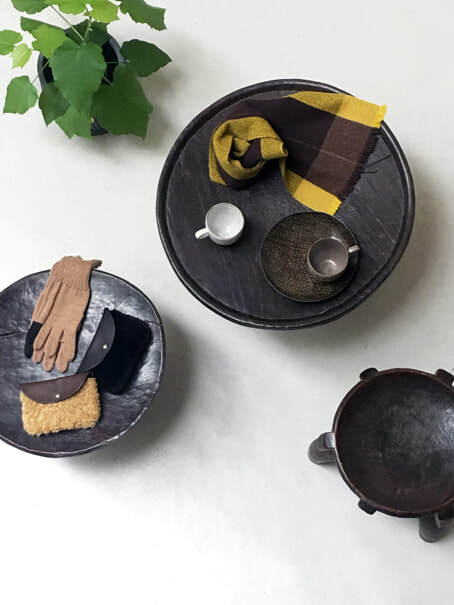 Maiko will be showing her vegetable tanned leather bags and bowls. Her little purses made with soft shearing and textured leather are so tactile you just have to stroke them. Tomoko works closely with an Alpaca farmer and spinners in the UK to produce her special knitwear and accessories for this exhibition. She has mixed two different types of Alpaca to achieve different textures. Her yarns are not dyed and come naturally in different shades of greys and browns. I hope you will enjoy discovering our unique touches evident in the pieces you will find at the Livingstone Studio.